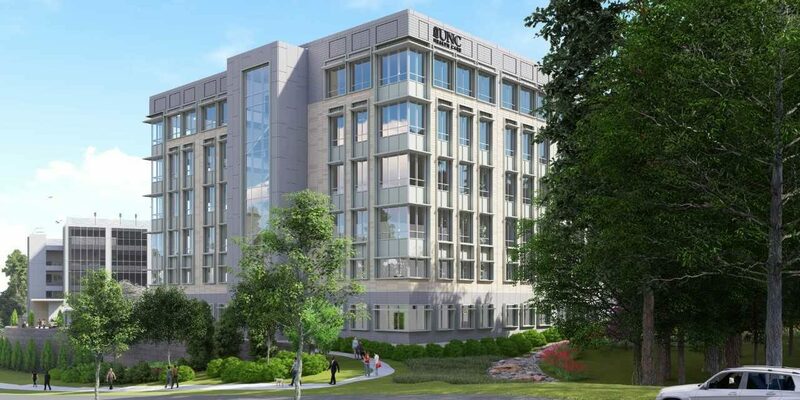 Just off of 15-501 on the very east side of Chapel Hill, UNC Health Care’s 48-acre Eastowne property is a work in progress. Construction has already started on Medical Office Buildings on the western corner of the property, but work has yet to begin on the majority of the land there. UNC Health Care is still in the process of planning for construction in that section. The health care system recently hosted a walking tour that brought together local residents, building planners, and officials from the town and UNC Health Care. Chapel Hill Mayor Pam Hemminger took part in the tour. She said she saw Eastowne as an opportunity for growth for the town. Hemminger praised the partnership between UNC Health Care and the town in developing this site. She said the property has challenging topography to build on, and officials were worried about traffic congestion on 15-501. Several residents who took part in the tour voiced their concerns about the natural area at risk from construction. Hemminger said stormwater run-off and tree deforestation were an important part of the conversation with site’s developers. Over the next 18 months, UNC Health Care will start to finalize its master plan for Eastowne. They will meet several times with the town council and advisory boards throughout that process. Edit: A previous version of this story said the timeline for the master plan would be finalized over six month. Actually, the timeline will be finalized over the next 18 months.